Jeffrey Pryor decided to simplify his life, ease his debt and begin a new adventure when he purchased an old bus to convert into a new home. With plenty of skill, talent, time and creativity, Pryor was able to create the home on wheels of his dreams. 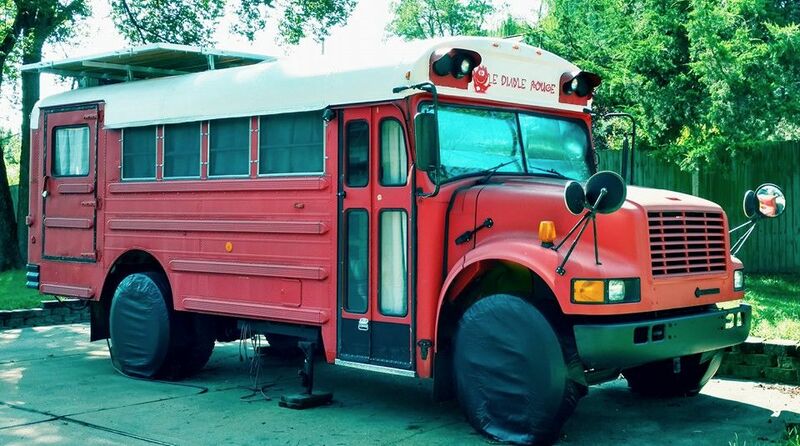 Lovingly referred to as Le Diable Rouge, the bus may look small, but it's big on ideas, comfort and details, making it the perfect home for its owner. Some of the coolest things about this bus include the bed created from old bus seats, a dresser and storage bins made from reclaimed wine boxes, a gorgeous bathtub and a flip-top table. Pryor made his dreams a reality and, in the end, will save money on living expenses. The bus is outfitted with a tankless water heater, composting toilet and glowing LED lighting that provides warm light to the home in the evenings. Climb aboard Le Diable Rouge and see why its owner is so pleased with his new digs — and the adventures he's now free to go on. On the left you'll see the kitchen area, and on the right, a comfortable bed. Check out the beautiful wood paneling on the ceiling and interior. A flip-up dining table saves space when not in use, and reclaimed wood provides rustic countertops in the kitchen. You can see the tether that connects the table to the ceiling so that it can be unhooked and stowed out of the way easily. The kitchen includes a cooktop range, half-size refrigerator and lots of storage drawers, including hanging shelves above the kitchen counter for even more space. Notice the cute curtains — a small detail that adds a more homey feel to the space. A stainless steel sink looks right at home next to the wood counters and cabinets. The custom-built bed has shelves underneath for clothing storage. Reclaimed wooden wine boxes look cool and chic as part of the wood used to create the bus's features. It adds something special to the way the interior looks and gives it some character! Ready to climb into Le Diable Rouge? Pryor decided to leave the exterior red paint intact, thus helping inspire the name of the bus. The bus even has its own nameplate! Time to hit the road on The Red Devil!